In the traditional way of financial services, customer has to go to agents for identification relevant activities. For example, open bank accounts, sign official paper. But in the digital world, customer requires more convenient and sophisticated solution to deal with such problem. Online identification and digital signing provides great benefits for user experiences and cost saving. As the best-in-class solution of digital identification, IDnow is a good candidate to fulfill business scenario of identification and online signing. The IDnow has different products and various services to support online identification and signing. Here I am going to utilize “IDnow Vidio-Ident” to identify user online and create authentic business partner in SAP system. The architecture is simple, SAP and IDnow are integrated via RESTful API. A Fiori application is provided to ask user to fill in all necessary information for user account creation. IDnow agent will be involved to identify user online or offline to make sure customer’s information is authentic and valid. Verification result then will be sent back to SAP to create user account. 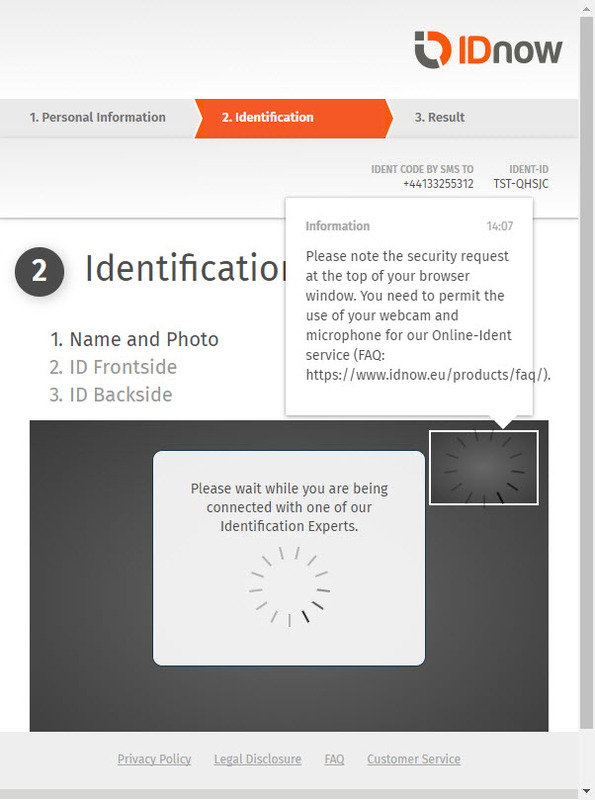 In order to integrate with IDnow, you have to contact with IDnow (https://www.idnow.eu/company/contact/b2b/) to register your company ID and get test API key for calling IDnow APIs. Because we are using RESTful API to do communication between SAP and IDnow, you have to make sure the gateway service is available in SAP system in case of integrating to SAP on-Premise system. The gateway service is mainly used by us to communicate with IDnow. In the testing environment, the domain “gateway.test.idnow.de” is recommended to use, otherwise you might get charged by some real-world activities. To ensure all parameters are encrypted, all requests to the IDnow server are always performed using HTTPS rather than HTTP. 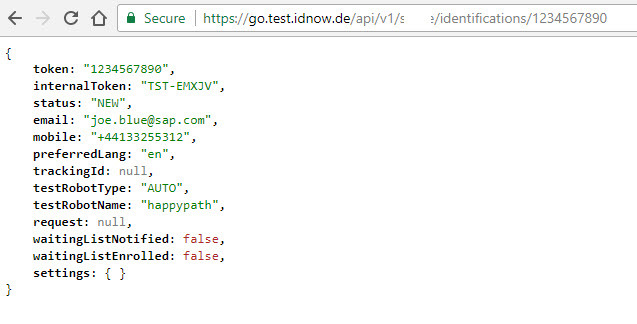 For example, the URL https://gateway.test.idnow.de/api/v1/<conpanyid>/identifications/<transactionNo>/start is used in this example. There are abundant parameters in the API body definition, in order to capture as much information of user identification as possible. Refer to the API document for detail of those body parameters. After receiving internal ID from previous step, it is possible to redirect the user to IDnow’s identification process: redirect to identification process. The identification process can also be embedded as an iframe or opened as a popup dialog box. A popup dialog box will be opened and ideally an agent will chat with you online. Because we are using testing subdomain for testing, so no agent will be available to interview online. Here we pick up “Manual” testing method to go through identification process with IDnow. According to the API document, the testing scenario can be controlled by certain naming convention: “<Prefix>-<test_scenario>”. In the request result, the status is changed to “STARTED” which means identification is started. Returned status represents the URL request is accepted by IDnow. Assume that user information was verified by IDnow service/agents, we can create business partner now for the user who went through the IDnow identification process. We can consume SAP S/4 odata service to create new business partner. Creating business partner in SAP S/4 is simple, so this will not be introduced in this document as I am focus on IDnow APIs here. Then sending request to IDnow. The access token which acquired in previous step can be used as header parameter to get identifications. Rest of IDnow APIs are similar to APIs above. Please refer to API document for detail information.